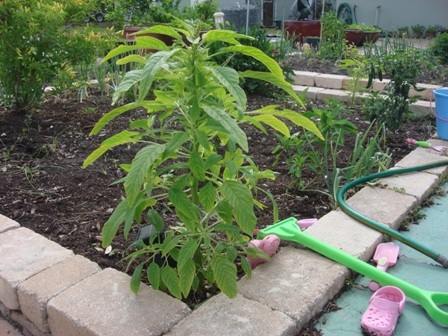 This is a picture of callaloo growing in our garden. I will do a future post on callaloo because it requires special attention. It is such an awesome food source. I obtained these callaloo seeds from a place named ECHO. I was elated to find them. ECHO is a non-profit, Christian organization that is dedicated to fighting world hunger. They help families in developing countries to grow food under difficult conditions. They tell them what food will grow where they live and they teach them how to grow it. Not only do they teach them about agricultural techniques, but about animals as well. They teach the poor farmer to use their rooftops, concrete surfaces and how to use clever containers to grow their food. ECHO trains interns and missionaries in tropical agriculture and animal husbandry and they grow seeds for their seed bank. We are lucky enough here in Southwest Florida to have public access to their global village where they do all this training and provide tours. They have a wonderful book store that sells a wide array of books, cards, neem products and of course…seeds. The best part is the nursery that is located across the street from the book store. They have a wealth of rare and unusual fruit trees, herbs, and vegetables (sales tax-free too). I have bought so many splendid edibles from them over the years. I don’t think I have ever left the nursery empty-handed. One of my favorite purchases from them was an Indian pepper bush that produced hundreds of peppers non-stop for two years… until a hard freeze finally got it this year. They don’t always keep a certain plant in stock. If you see something you want, I would recommend buying it then. They might not ever get it again. I haven’t seen my Indian pepper for sale there since I bought it two years ago. I did save my seeds though and I hope to germinate them when it warms up this year. The staff that work in the nursery are interns who are always full of information and very helpful. If they can’t answer your question they will radio someone who can. They are having their 19th Annual Farm Day on March 13, 2010 from 9 a.m to 3 p.m. I have missed it every year but will definitely be attending this year. They have more information about this event on their website. The ECHO website is worth a visit. Click on the agriculture tab at the top of their home page. Click on agricultural information and then click on ‘book, amaranth to zai holes’. You’ll find an enormous amount of information. Their blog is great too. My kids love to visit ECHO. They are always excited about what treasure we will find to take home to add to our garden.